Scrolling through my Facebook feed, I am amazed how often I will scroll past an ad without noticing until a few seconds later. Advertisers are getting smart with how they present their content. One of the scroll-stopping ads that caught my eye right away was an ad for Brilliant Earth. They specialize in wedding and engagement rings. A few of my friends liked the post, so it showed up on my feed. One of the strengths of this design is that despite the distractions from other ads and posts, this one caught my attention. The yellow in the background caught my attention because of the bright contrast to the white and blue of Facebook. As well, even though the yellow caught my attention, the first thing I noticed was the ring. It’s right in the middle of the picture, and it’s prominent. A weakness I can see with this design, though, is the lack of contrast between the color of the hands and the ring. The flow created by the hands leads eyes to the ring, but the contrast isn’t big enough to bring someone to that right away. It seems that the ad is trying to bring awareness to their business, but more than that, to get customers to convert. They want to make money off their rings (obviously). The ad does this by creating an emotion with the image. The yellow emotes happiness and becoming engaged is definitely a happy feeling. As well, a detail that may be subconscious is that her hand is “excited” and ready to receive the ring. She’s happy to be engaged. That’s one of the common fears with getting engaged; the fact that they may say no. The metric that will show the most success with this ad will be the click-through rate. 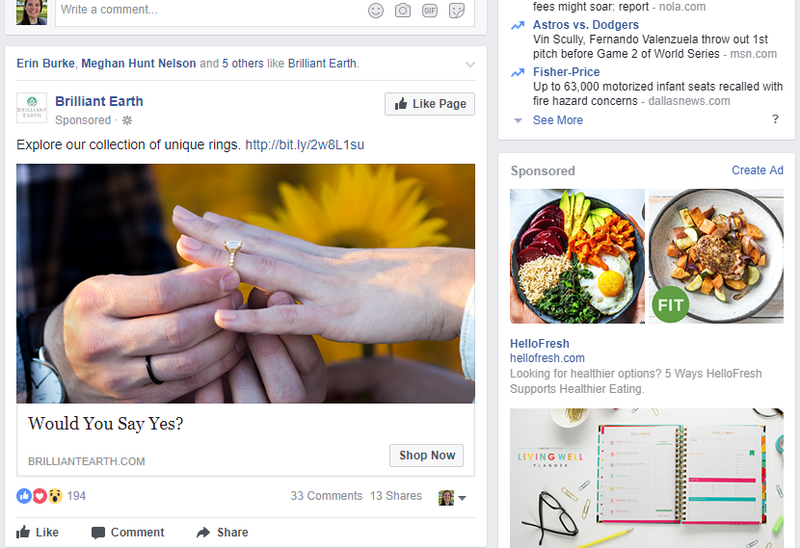 The goal is to get conversions, and that means people will have to click through the ad to get to the site and buy jewelry.